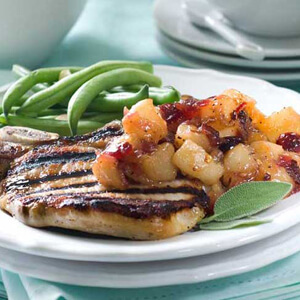 Surprisingly, the sweetness of the Comice pear adds dimension to this Southwest Chicken and Pear Salad combining ingredients you'd expect in a salsa. Anjou or Bosc pears can be substituted. Dip pears in lemon juice; arrange on lettuce leaves with chicken slices. Combine remaining ingredients except cilantro leaves; spoon over pear halves and chicken. Garnish with cilantro leaves.